Buy cheap Biolens 55 Alta Definición contact lenses. Cheap lenses Biolens 55 High Definition, optimal vision created by the Tiedra laboratories. 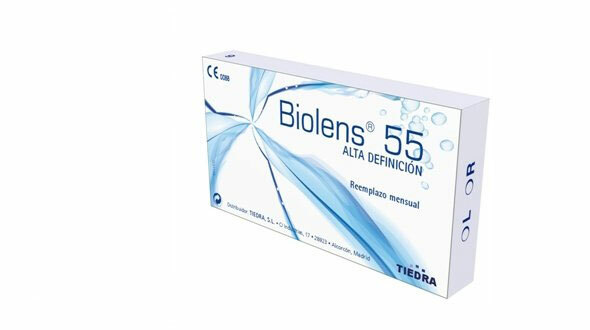 Biolens 55 High Definition is a monthly contact lens, manufactured by the Tiedra Eurolent laboratory. This lens is manufactured in Ocufilcon D, a high quality material, which provides great comfort in daily use, providing a measured hydration of 55% that keeps the lens stable during all hours of use. Thanks to its new edge design, the settlement of the lens in the scleral layer is guaranteed, minimizing the friction sensation of the lens with the eyelid, all due to the fact that these edges are finer, improving at the same time the sharpness and the contrast. Biolens 55 High Definition improves the vision of myopic and hyperopic patients thanks to the "Aberration Control System", which compensates for the spherical aberrations inherent in both contact lenses and the eye. The spherical aberration present in all eyes diminish the quality of the image that we receive in the retina as well as that produced in contact lenses, this unique design controls both aberrations, giving rise to a much sharper retina image. This monthly lens has three base curves, adapting perfectly to all types of corneas, avoiding problems of oxygenation and tear drop, increasing eye health. Its blue handling dye makes it visible in the lens holder case. It is also important to mention that these online lenses have a built-in UV filter, increasing eye protection to 100% ultraviolet. Regarding maintenance, it must be done with a unique solution or quality peroxide, the first brands are those that pass better quality controls, guaranteeing and minimizing possible allergic reactions to the components of the product. In Prodevisión you will find Biolens contact lenses in 6 lenses per box format, with guarantee of authenticity, fast service and secure payment. Buy your cheap Biolens lenses at Prodevisión.